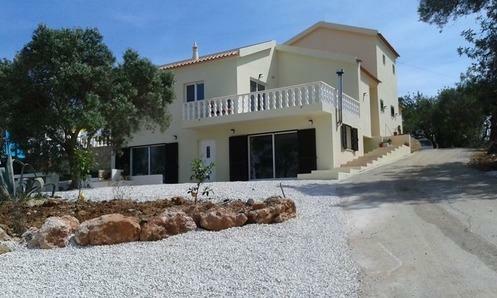 5 bed villa with 2 bed cottage - Property for sale. Full Description: Magnificent property in Fontainhas on the outskirts of Albufeira within walking distance to local cafes and shops and just a short drive to the main resorts beaches, restaurants and nightlife. Completely renovated in 2015 to a very high standard this villa offers both spacious living accommodation in the main house as well as separate accommodation in the self contained cottage annex. Perfect for a family home in peaceful and picturesque surroundings with the option to generate some income through holiday lets and/or B&B. The main house is on 2 levels, the ground floor comprising fully fitted and equipped kitchen with separate laundry/storage room, dining area, lounge with wood burner, sitting room with tea/coffee making facilities for guests, hallway leading to 4 double bedrooms, all with wardrobe/cupboard storage and each with en-suite shower room. All rooms lead out to open and covered terraces with garden views to the rear and swimming pool views to the front. In the main entrance hallway there is a guest w/c and stairs leading up to the master suite with fitted wardrobes, en-suite with oversize shower and doors to a private balcony with superb views of the surrounding countryside. Outside are numerous seating areas, BBQ, terraces and beautiful swimming pool with clever built in seating at one end...perfect to cool off with a refreshing drink! At the front of the house is access to the cottage annex which has 2 en-suite bedrooms with fitted wardrobes, one with bath and one with shower, lounge with wood burner, dining area and fully fitted and equipped kitchen. The master bedroom and the lounge have doors to its own private terrace with BBQ and outside dining area again with country views in tranquil rural surroundings. The cottage also benefits from its own private swimming pool with sun bathing terraces and plenty of private parking in front. The whole property sits on a fully enclosed plot of 2865 sq m, plus comes with an additional rural plot of 1820 sq m which is adjacent to the house. This is a unique opportunity and must be viewed to appreciated fully. Priced to sell quickly early viewing is recommended.